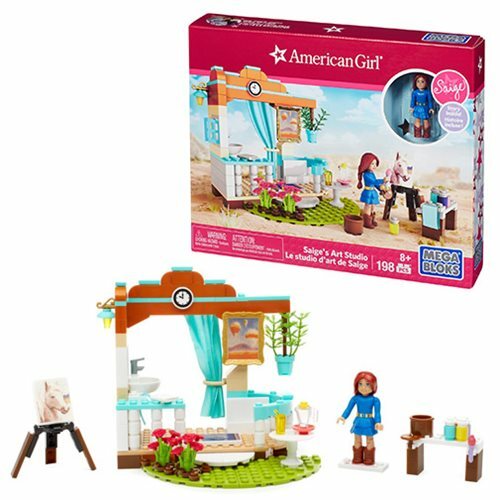 There's nothing Saige loves more than painting, and now you can help her create a masterpiece when you build Mega Bloks American Girl Saige's Art Studio! Set up the easel, dip the paints, hang the plants, and let your imagination run wild. Saige loves to draw horses, but what will you have her paint? Once your masterpieces are done, you can hang them up and decorate the buildable studio! But don't forget to close the curtain and clean up in the sink when you're done! And when you're all cleaned up, celebrate your artistry with freshly squeezed lemonade! Includes 198 pieces. Ages 8 and up.